The CMY Suite was co-published by Flatbed Press located in Austin, Texas in 2018. The suite was printed by collaborating printer Annalise Gratovich and myself. The three plates are each published in an edition of ten with additional impressions that include: two Flatbed impressions, one printer’s proof and one artist’s proof. I developed the extensive plate tone by hauling the steel plates around in the back of my ranch truck for two years occasionally checking to see how the decay was proceeding. 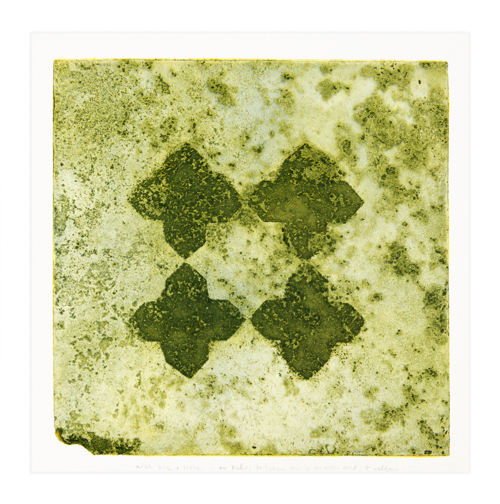 The plates were etched with the assistance of Katherine Brimberry in nitric acid at my studio in 2017 . The suite was printed on 640 GSM Lanaquarelle hot press paper. Hanco lithographic process color inks were used in the following combinations that correspond with the order of the images above: Cyan/Magenta, Yellow/Magenta, Cyan/Yellow, and Cyan/Yellow/Magenta. These are available as boxed sets of four print in each box that includes a cast iron sculpture that is fabricated from cast iron components configured to match the silhouette in the prints. These are available through Flatbed Press .